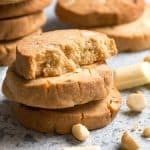 White Chocolate Macadamia Nut Cookies – a copycat recipe of the popular Byron Bay cookies found in cafes all across Australia! 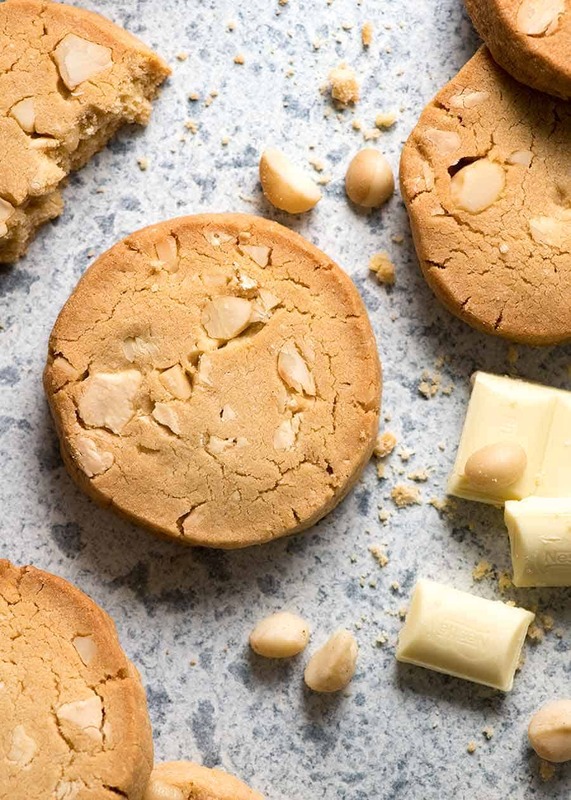 The combination of white chocolate with the soft creamy crunch of macadamia nuts in a big, thick, buttery cookie is a match made in heaven. Byron Bay cookies changed the Aussie cookie market forever when they first came out. They were known for their size (big! ), the buttery crisp-but-melt-in-your-mouth texture and most importantly, the generous amounts of “stuff” inside. Big chunks of chocolate, nuts, M&M’s. Nobody eats a Byron Bay cookie and is left feeling dissatisfied!! They’re now found in cafes all across Australia, and as popular as ever. They also come with a fairly hefty price tag of $4.00 each. So it was inevitable that I’d pursue a copy-cat version with a vengeance! This recipe is a copycat of Australia’s most popular cafe cookie – Byron Bay cookies! This recipe was developed using Shortbread Cookies as a base which has a similar texture and flavour, then tweaked by referencing the ingredients listed on the Byron Bay Cookie jars in cafes (I cheekily took photos of the labels to reference back at home!). 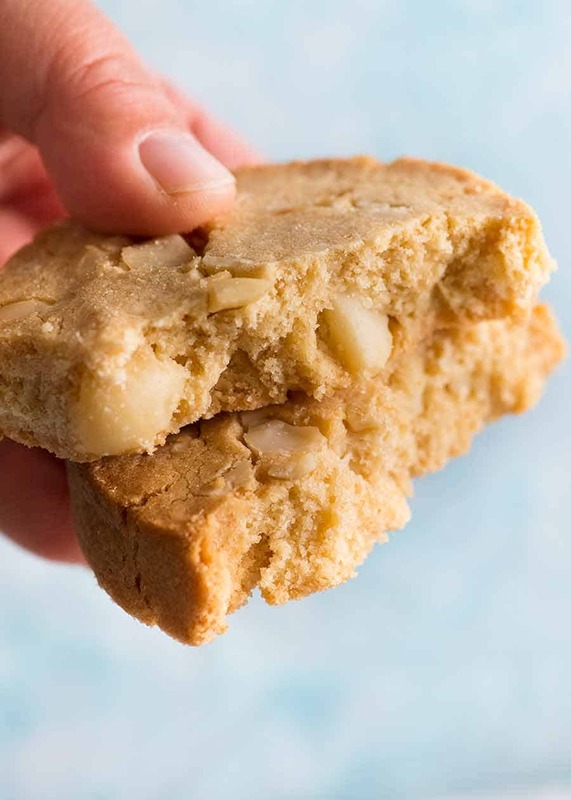 Macadamia nuts and white chocolate – the base cookie is the same for all white Byron Bay Cookies so feel free to sub this with other “stuff” of choice – choc chunks, M&M’s (the Dotty Cookies! ), other nuts, dried fruit, caramel bits etc. This recipe is one of those recipes where you form a log which is refrigerated to firm up, then sliced. In the spirit of Byron Bay Cookies, I make these BIG and THICK!! I use a hand held beater here but it can be done with a stand mixer or even with a wooden spoon and a bit of an arm work out. 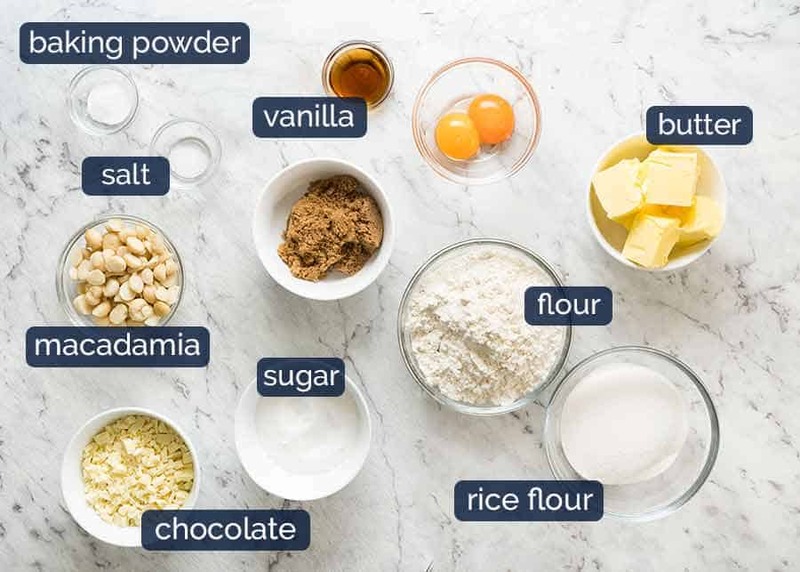 It cost about $12 for all the ingredients, and this recipe makes 13 cookies (because it would be asking too much for any recipe I invent to make a nice even number like 12 cookies). So at $4 a pop, this makes $52 worth of cookies. PS These cookies keep very well, staying the same texture rather than going soft like some cookies do. The record so far is 4 days. I’m holding onto 1 cookie to see how long much longer it will last. Gourmet Fruit & Nut Crackers for Cheese – homemade version of the rather expensive fruit and nut crackers to serve with cheese! Homemade is incredible – the flavour is so much better than the store bought. Plus it’s way WAY cheaper! Muesli Cookies (Breakfast Cookies / Granola Cookies) – copycat of the thick, chunky, chewy muesli cookies sold in cafes across Australia. A healthy breakfast option because it’s like a bowl of oatmeal in cookie form – refined sugar free, low fat, gluten free, keeps you full for ages but it tastes like a sweet cookie! Recipe video above. Copycat of the famous Byron Bay Cookies sold in cafes across Australia, these are big, thick and buttery with a crisp texture that melts in your mouth. 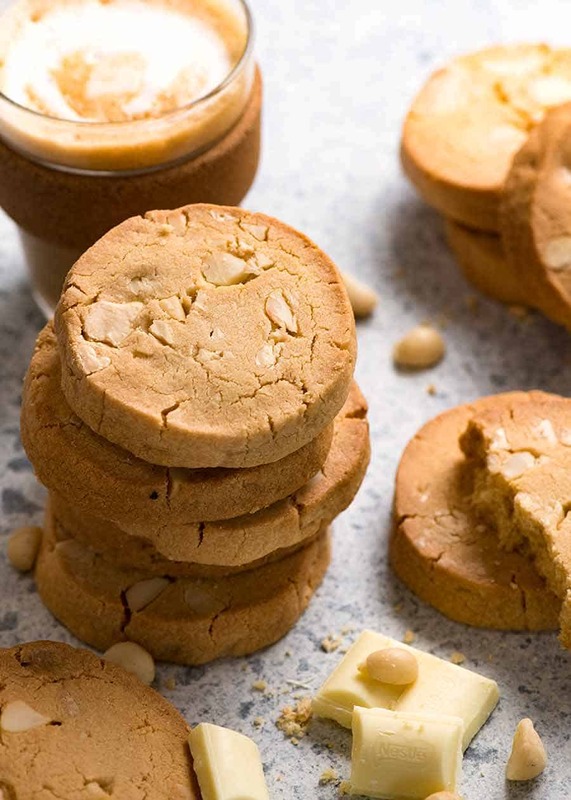 White chocolate and macadamia nuts is a classic cookie combination! Beat butter, sugar and salt on medium (speed 5) using a hand held mixer for 1 minute until smooth. Add egg yolks and vanilla, beat for 1 minute or until smooth. Add baking powder, rice flour and half the plain flour. Beat with mixer until flour is incorporated. Add remaining flour and beat with mixer until flour is incorporated. Add macadamia nuts and chocolate, then mix through with a wooden spoon (dough gets a bit too hard to use mixer). Scrape mixture onto a work surface, press together and shape into a 22cm/9″ log. Roll up in baking paper or cling wrap, twist ends then refrigerate for 2 hours. Preheat oven to 200C/390F (or 180C/350F fan). Line 2 trays with baking paper. Remove log from fridge, unwrap and slice into 12 x 1.75cm / 3/4″ thick slices. Place 6 on each tray, bake for 10 minutes. Turn oven down to 170C/340F (or 150C/300F fan), switch the trays between shelves. Bake 15 minutes, remove from oven and cool cookies on tray. 1. 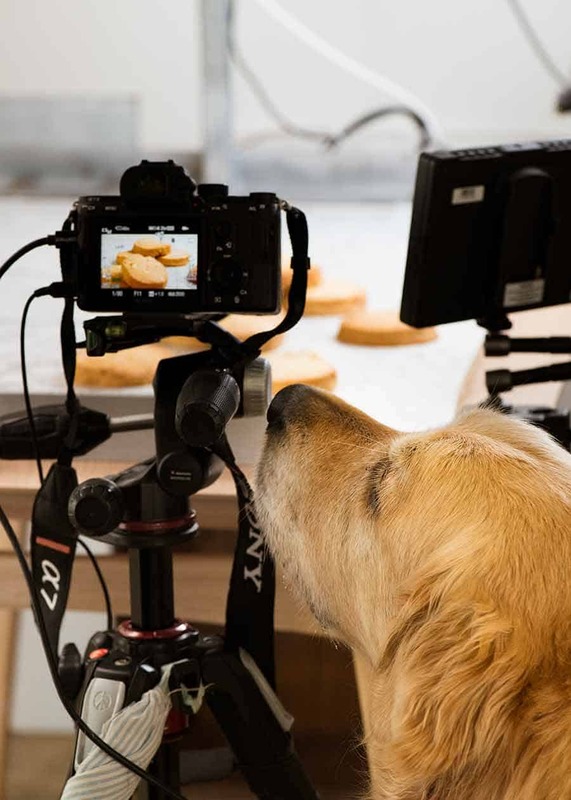 Rice flour – makes the cookie texture slightly more “velvety” just like Byron Bay cookies. 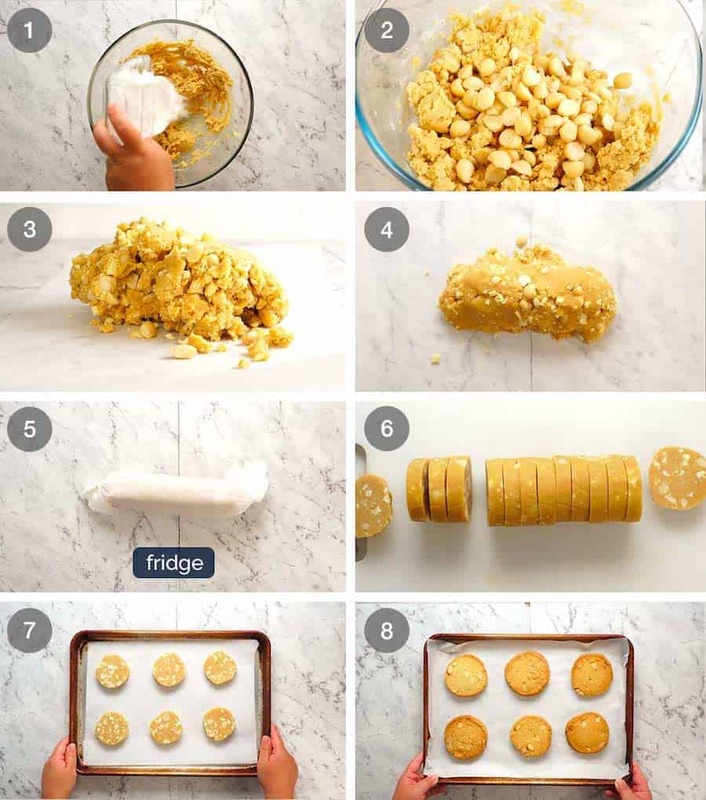 Found alongside cornflour/cornstarch in the baking aisle, use leftovers for Shortbread cookies! Sub with normal flour. 2. Macadamia nuts – chop these into largish pieces, halves or quarters. You want nice big pieces for optimal eating experience! 3. White Chocolate – Use eating chocolate rather than baking white chocolate. Cut smaller than the nuts. If too large, they can make the surface too cracked because there’s too much big “stuff” in the cookie. The trick here is to have more bits of white chocolate throughout in smaller pieces (concluded after close inspection of Byron Bay cookies!). 4. Customise – switch the macadamias and chocolate for other things of choice, such as chocolate chunks, dried fruit, nuts, caramel bits. 1 – 1.25 cups in total. Or top with M&M’s for the Byron Bay “Dotty” cookies! Different measures in different countries – recipe has been written to cater for different cup sizes in different countries. Only exception is Japan – please use weights. 6. Storage – keep in a super air tight container for 4 to 5 days, keeps perfectly with no change to texture. Not sure about freezing – will update if I try. Executive Producer Dozer, reporting for duty! The post Byron Bay White Chocolate Macadamia Nut Cookies appeared first on RecipeTin Eats.